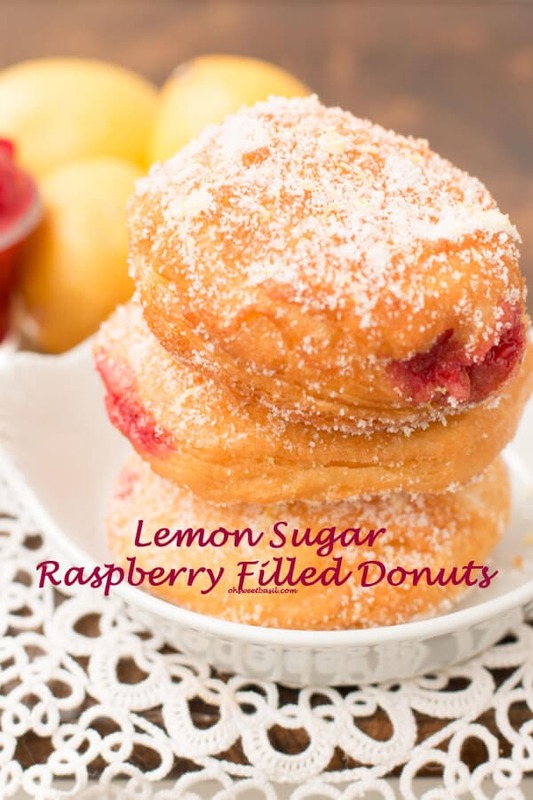 Obsessed with these lemon raspberry donuts and they only took 5 minutes to make!! There’s something so good about the combination! 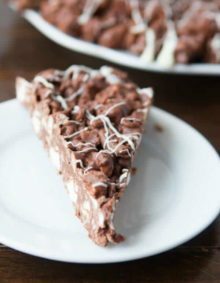 So, this is a recipe from last month, but it has taken a while for me to get it up because there have been so many yummy recipes that I just didn’t want to move out of the way. Anyway, the girls have been sooooo excited about the movie, Frozen as I’m sure every girl has, and as we actually think it’s a pretty darn cute movie too we decided to get back to our kid like selves and do something totally fun for the girls and these lemon raspberry donuts were definitely the highlight of the evening. Like, for real. 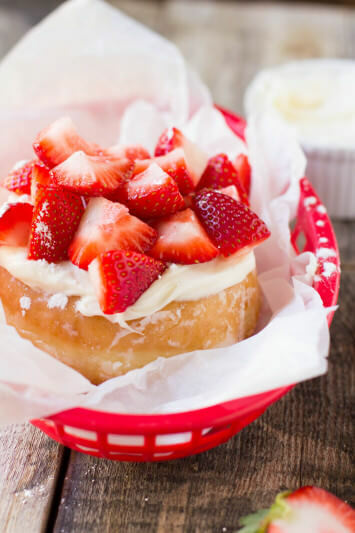 They are in serious competition for our favorite donut with strawberry shortcake donuts. I know this may seem quite silly and not like anything cool, but we had such a fun evening totally not being adults. We surprised the girls by grabbing dinner from one of their favorite places, Cafe Rio where one loves the quesadillas and the other only wants a side a pork, brought it home to where Cade had set up an indoors picnic for us complete with a favorite movie. We all sat on our family room floor on blankets and pillows, chowing down on dinner we didn’t have to cook and then just as Olaf was making everyone giggle I busted out the donuts. And now I’m kicking myself because if you follow on facebook you know I made the mistake of editing photos late at night and then all I wanted to do was fry up another batch and now here I am writing the post late at night and drooling over these lemon sugar, fried, deliciously stuffed with raspberry filling donuts, oh golly I need another. Are Donuts Baked or Fried? Yeast donuts are deep fried. 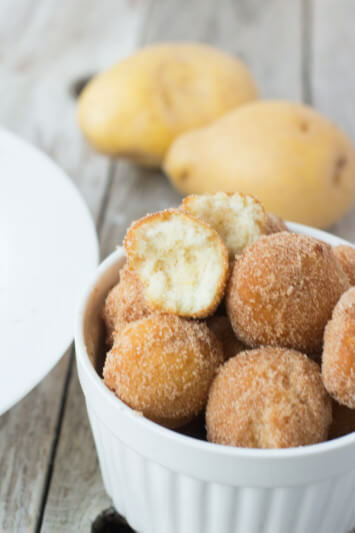 Cake donuts can be either baked or fried. Wash and scrub the outside of the citrus fruit very well. Remove the zest (leaving the white, bitter pith behind) with a lemon zester or a microplane. A zester will give you long thin strands while a microplane will give you small bits of zest. You can also zest a lemon using the smallest grate of a cheese grater. How Long Will Donuts Keep? 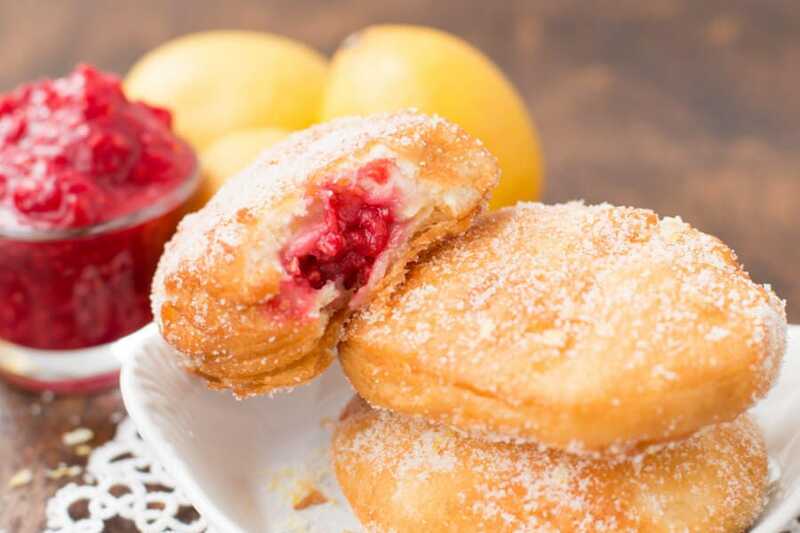 Properly stored, freshly cooked donuts (not cream-filled) will last for about 1 to 2 days at normal room temperature; cream-filled donuts should be stored in the refrigerator. Heat a dutch oven over medium heat, filled 1/3 up with peanut or canola oil. Separate each biscuit, then separate the halves. Place 2-4 biscuits at a time in the oil, making sure there is plenty of room for frying. With a metal slotted spoon or spider continuously flip the donuts until golden on each side. Meanwhile, stir together the sugar and lemon in one bowl, and the teaspoon of sugar with the raspberries in another bowl. Place the raspberries into a condiments bottle or pastry bag with a small, pointed tip. 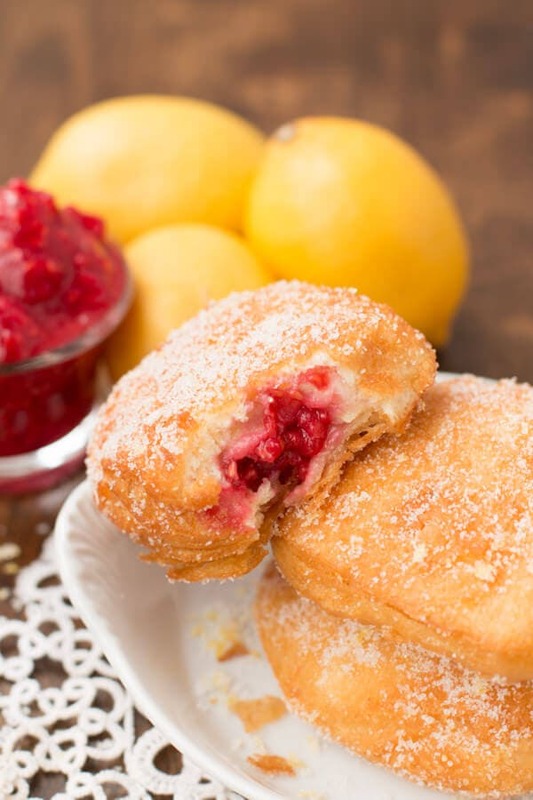 Press into the donut and fill with the raspberry filling. Sometimes I use a sharp knife to start the hole. Roll in the bowl with the lemon sugar and serve immediately! I made these for breakfast this morning…WOW! Easy, fast, and extremely tasty! Thanks! I wish I was eating breakfast at your house! Thanks, Rob!! 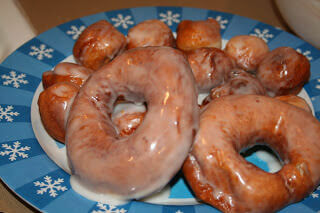 I would love to win a tablet and I can make your donuts from oh, sweet basil website. Just love the recipes you share. Thank you! would love to win the tablet—–donuts are a plus, too! wow, what a blessing it would be to win this ‘surface’ tablet! 🙂 i could do instagram then, lol! i do want to try your donuts! they sound delish… i haven’t made donuts in many years!! the donuts look yummy – winning the Surface would be the icing on the donuts! 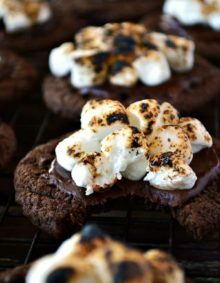 I am going to try these for my work team this weekend! They sound amazing! I want these in my life right now!! These donuts look incredible! Love the raspberry lemon combo! 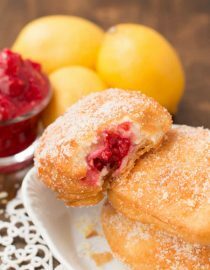 i love the idea of putting raspberries inside the doughnuts. yum! You definitely saved the best for last!! These donuts look to die for!!!!!!! Seriously wishing I had a bazillion right now! I think I ate more than anyone which is probably why I had no desire to do anything or move the rest of the night, haha! It took me 3 yrs to get a tablet and 12 days for my kids to break it! Oh, how I NEED this.. 🙂 This time no grubby kids are touchingymy stuff! I would love, love, love to win this tablet. My computer recently died, and being a stay at home mom without a functioning computer can be difficult. This would make my life sooo much easier!! Why oh why weren’t these waiting for me when I woke up this morning?! They look amazing! I would love to win the Surface tablet because my husband and babies are always stealing my laptop and phone! I could hide from them with a tablet!!!!!!! These donuts look fantastic! Love the lemon raspberry combo! I would love to win the Surface so that I can use it in the kitchen to follow recipes while I cook. I’m tired of printing recipes out on paper all the time. I want the Surface 2 so I don’t always have to drag my laptop around when I need to work out of the office. These donuts look delicious! I MUST-DO 🙂 thanks for the recipe! I would LOVE to win a surface tablet! I have a 10 year old HP laptop that is about to die on me any day now… I have used an IPad before but never tried a Surface. You make it sound amazing! Sounds like a fun night! I mean, who doesn’t love Frozen? And these donuts look incredible! Thanks for the giveaway, I would love a Surface to tote around when I travel! right? It’s not a popular movie or anything right? haha. It is the best for traveling! Oh my, these look so simple and delicious. I would love this so I could stay in better contact with all my family that lives across the country. I would love to get the tablet. It’d make a great mother’s day present for my mom! I would LOVE a surface 2 because of its great portability! I’m in the last few years of school and would love it as a back up for my oldddd laptop! I gotta have something that will last! Oh man, I am a sucker for a good donut. I could you’d the Surface for school. Instead of having to lug around my laptop and all my books, I could take notes and have my books on the Surtace! I would absolutely love this windows tablet. My friends have windows tablets and I would love to use it at school. My laptop no longer works so reading blogs on an iPhone isn’t ideal. what a great recipe to try. 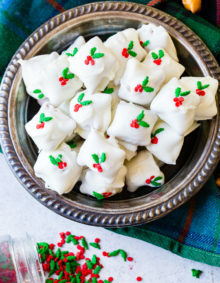 I would like to learn how to make some of your recipes but I don’t have a portable tablet to search .I have an old computer that’s really slow.it would be nice to win one since I cant afford one. These donuts look so so good!!! I’ll be giving them a try. I’m sure my girls would enjoy them. Now the tablet I could use for sure! Thank you for this awesome giveaway. I love your blog! I’d love a tablet so I wouldn’t be chained to a desktop computer. I’d love to have the tablet to use bake/cook instead of my little phone screen. I would LOVE one of these!!!! Fingers crossed!!! My children would love these donuts. They’d also love the Surface lol Homework would be a lot easier since they use iready. Id LOVE the tablet for my husband!! He starts Physician Assistant School at the end of May! Windows surface would be an amazing addition to my work! Just to be able to use something bigger and faster than my phone would be fabulous! I would love to win the tablet Because I always wanted one. BUt can never get my hands on it. I would love to win the tablet for my daughter. This would be an amazing help for my new small business! Eeep! Crossing my fingers!! I would love the surface to use instead of my laptop. With my husband facing his 3rd deployment in 4 years this would be perfect for helping him stay in contact with myself and our 4 year old little girl. Would love to win this tablet! I never win anything but winning this will make up for all those times. What a fabulous treat, I definitely eat more than one of these! I’d like it for my boyfriend honestly. Though if he let me borrow it I’d probably fill it up with saved recipes from pinterest and other sites. I would love to get my hands on a Windows Tablet. Man, these donuts are calling my name. two of my favourite flavour combos, Pinned! This would be great for me to use for school. Our family loves the Frozen movie. Seriously Olaf is the best part besides all the singing. he’s amazing. Such a great character!! I don’t typically like donuts, unless they are filled with raspberries or covered in sugar, so this is like the my two favorites combined! I would love a windows tablet so I could stop stealing my kids Kindle Fires!